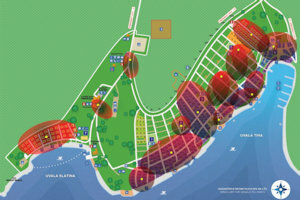 Camp Slatina is located on the west coast of the island of Cres, in the village of Martinščica not far from the historic town of Cres. Cres is a town of rich history reflected in numerous cultural facilities. It is located in a bay within a bay – also-called mandrač. Plenty of options are available beside the camping accommodation services. 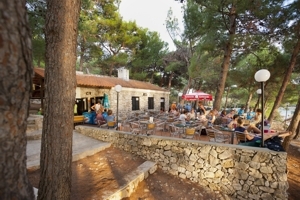 You can enjoy the island’s gourmet specialties in our camp restaurants while having a drink and exploring the landmarks of the islands of Cres and Lošinj on the internet, at the same time enjoying a wonderful sunset. The grocery store within the camp offers fresh fruits and vegetables and other groceries you may need. Camp Slatina offers pontoon mooring in Tiha Bay. Martinščica, where the camp is located, is a small fishermen’s village with a few restaurants, pastry shops and bars, where they have entertainment events in summertime. 30 km from the camp, the town of Cres is a historic town with many cultural and entertainment options. It has several museums and other interesting places to visit, such as the town tower, Franciscan monastery and town church. In summer months, many entertainment events are held in Cres, the most interesting one surely being the summer carnival in July.